9 Dead After Shootout Between Rival Biker Gangs In Central Texas : The Two-Way Bystanders fled for safety during the shootout at a busy restaurant in Waco shortly after noon on Sunday. The number of injured is unknown. Authorities investigate a shooting in the parking lot of the Twin Peaks restaurant Sunday in Waco, Texas. 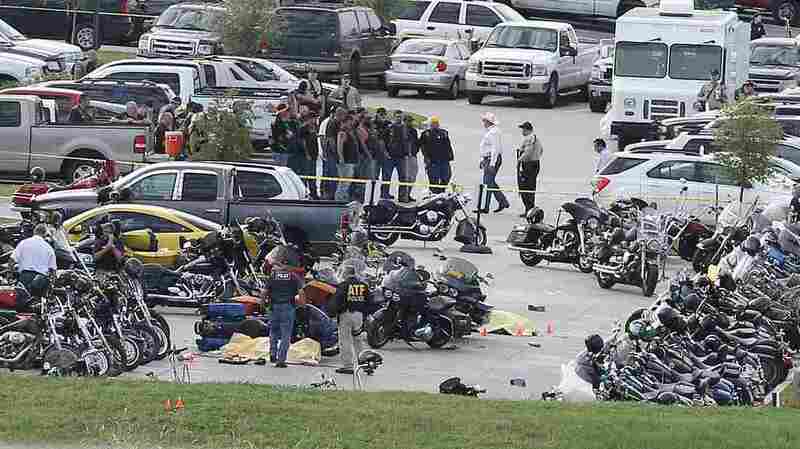 Authorities say the shootout victims were members of rival biker gangs that had gathered for a meeting. A brawl among as many as five rival motorcycle gangs turned deadly on Sunday in Waco, Texas. Nine bikers were killed and 18 injured at a popular sports bar frequented by the gangs. No bystanders or employees were hurt. Waco police said trouble had been brewing at the Twin Peaks bar and grill for some time. Bikers had been congregating there in ever-increasing numbers, and there had been more and more arrests for fights and weapons. Authorities had intelligence that there was a high potential for violence on Sunday. And they were right. About 12:15 p.m. local time, a fight reportedly started in the bathroom, then moved into the bar and finally spilled into the parking lot, where the motorcycle riders went at each other with guns, knives, chains and clubs. Sgt. Patrick Swanton, a spokesman for the Waco police, says: "Our officers engaged hostile targets, and we started shooting at people who were shooting at other people. Those individuals also turned on our officers, and fired at our officers." Waco police and SWAT team members — who were already on hand — returned fire. He said the investigation will determine which of the nine dead gang members were killed by other bikers or by police officers. Swanton described the crime scene as "gruesome." Helicopter video from KTVT Channel 11 in Dallas showed about two dozen heavyset men wearing vests with their club insignia sitting glumly in the parking lot under heavy police guard. They were frisked, flexi-cuffed and loaded into a bus one by one. Scores of bikers are being held for questioning. Police said all nine who were killed were members of two gangs, the Banditos and Cossacks. The police spokesman criticized Twin Peaks for advertising weekly biker nights even as the crowd got rougher and rougher. Police said they tried to get the restaurant to stop hosting the outlaw gangs, but it refused. A Twin Peaks official wrote on the corporation's Facebook page: "We are horrified" by the tragedy in Waco, and "we will continue to cooperate with police as they investigate this terrible crime."